Recipe is gluten free, dairy free and also free from soy, peanuts and refined sugar. It makes enough for two 8 oz glasses and it's also vegan and paleo friendly. Blend up frozen strawberries and set aside. If too frozen to blend, add 1 tsp water at a time. Should be slightly chunky at the end. Line glasses with thick strawberry puree. It will melt a bit while the rest of the mocktail is made, which will make it smoother. 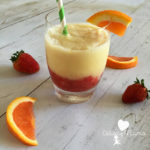 In a blender, add your ice, orange juice, pineapple juice and coconut milk and blend on high until smooth. Pour the thick mixture over the strawberry puree layer, using a spoon if needed to help it out of the blender. Add fun straws, orange or strawberry slices to the rim of the cup.